With just two weeks remaining in the season it was time for Division II cross country teams to take to the course for the nationwide running of regional championships on Saturday. All teams had just one goal in mind; advance to the Division II Cross Country National Championships that are right around the corner on December 1 in Pittsburgh, Pennsylvania. Before nationals, teams had to qualify and could do so automatically with a top-three finish at their respective regional meet. Below are the team and individual winners of each region along with what 24 teams punched their automatic bids to the NCAAs. Ten more teams will also be selected to join them during an at-large process by the NCAA Division II Men’s and Women’s Cross Country Committee for a grand total of 34 programs. The complete field will be announced at a later time. Charleston (W.V.) won the region’s title on the men’s side while the women from Edinboro accomplished the feat during its race on Saturday. It was the first regional title in Charleston history which will lead to the program’s first appearance in the national championships. 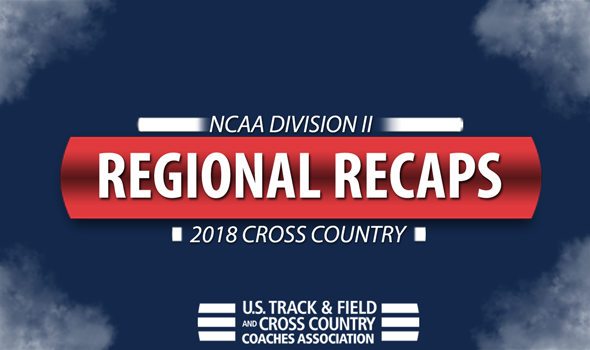 Shippensburg and Edinboro also earned automatic bids to NCAAs with its second and third place performance. Edinboro repeated as regional champs and have now won the title in four of the past six seasons. Five runners earned All-Region honors. California (Pa.) and Shippensburg also advanced to nationals. Jason Weitzel (Concord) and Alicia Belko (California Pa.) were the individual champions at the meet. Missouri Southern captured the men’s regional crown while U-Mary did the same on the women’s side on Saturday. It was the first regional championship for Missouri Southern since the 2009 season and the lowest score the program has posted at the regional meet in its history. Augustana (S.D.) and Sioux Falls will also be heading to NCAAs after finishing second and third, respectively. U-Mary won its third straight regional title with an impressive performance as it placed five runners in the top-14 at the meet. Augustana (S.D.) and Pittsburg State will also race at nationals. Missouri Southern’s Gidieon Kimutai and U-Mary’s Jaiden Schuette were the meet’s individual champions. Stonehill swept the East Region with strong performances on Saturday. The Stonehill men claimed their second straight title after posting 52 total points. It was the program’s fifth regional championship in school history. American International and Southern Connecticut will be joining them at nationals. Stonehill’s women’s program won its eighth regional championship in the past ten years after a 58-point showing. It was the 15th title overall for the Skyhawks. Second-place Roberts Wesleyan and third-place Merrimack will also be heading to NCAAs. The individual victories went to Leakey Kipkosgei of American International and Kendall Fitzgerald of Post. Grand Valley State was once again crowned champions in the Midwest Region as the men’s and women’s programs made it a clean sweep in dominating fashion. The Laker men won with 38 points and placed six athletes in the top-25 at the meet. It was the 17th straight regional championship won by the program. Saginaw Valley and Walsh punched automatic tickets to NCAAs as well. The Laker women posted 26 points in their victory and put six athletes in the top-15. It was the 18th consecutive regional championship in school history. Hillsdale and Michigan Tech also earned tickets to Pittsburgh. The individual titles went to Titus Winders of Southern Indiana and Sarah Berger of Grand Valley State. Embry-Riddle (Fla.) swept the team titles at the South Regional Championships. The Embry-Riddle men will be heading to nationals for the first time after collecting its first regional championship in program history. All five athletes finished in the top-16. Lee (Tenn.) and Florida Southern are also NCAA bound. The Embry-Riddle women also won their first regional title in program history after it recorded 78 points. It is the second consecutive national championships appearance for the Eagles. Union (Tenn.) and Lee (Tenn.) will be joining them at nationals..
Christian Noble of Lee and Sarah Edens of Embry-Riddle won the meet’s individual championships. Quite the battles went down in the South Central as the Colorado Mines men and Adams State women each won the regional title on Saturday. Colorado Mines knocked off the top-team in the nation in rival Adams State in collecting its title by a 49-57 margin. It is the second regional title for the program in the past three years. Adams State and Western State will race again at NCAAs after coming in second and third. Adams State repeated as regional champions but it wasn’t an easy task as Western State pushed them right to the finish line. Once the fifth runner came through for both sides it gave Adams State a one-point, 31-30 victory. Colorado Mines will join the two previous mentioned teams at nationals. Individual championships went to Grant Colligan of Colorado Mines and Alicja Konieczek of Western State. The men and women from Queens (N.C.) swept the Southeast for the first time since 2011. The Royal men totaled 34 points and won their first regional title since 2011. Queens had three runners placed in the top-five. Mount Olive and Augusta also picked up automatic bids to NCAAs with a second and third place finish. The Royal women collected their second straight regional championship with a 50-point performance. All of their scored athletes finished in the top-14. Flager and Anderson (S.C.) will join them at NCAAs. UNC Pembroke’s Joshua Chepkesir and Mount Olive’s Leah Hanle were the individual champions. The Chico State men and the Alaska Anchorage women won the regional championships in the West on Saturday. It was third consecutive regional title for Chico State and the 14th won by the program in the last 17 seasons. All seven Wildcats finished in the top-18 of the race. Simon Fraser and Alaska Anchorage will also be heading to nationals. Alaska Anchorage won the championship with a 66-point performance. It was the fifth regional title won in program history. Simon Fraser and Chico State will be joining them in Pittsburgh. Chico State’s Eddie King and Alaska Anchoage’s Emmah Chelimo took home the individual crowns.